A UK North East port has announced a new £12 million banking facility with Lloyds Bank that will enable the next phase in its rapid expansion. Port of Blyth is set to make major investments in its terminal infrastructure and the construction of new ware-housing, as well as strengthening quays and installing new cranes. Having reported a second consecutive year of record financial figures in April including a 17% increase in turnover, the port is now viewed as one of the UK’s fastest growing Trust Ports, driven largely by the continued development of offshore energy-related activities. This expansion has necessitated a record level of investment from the Port, via the consolidation of a long-term relationship with Lloyds Bank, with spending set to support key developments to serve clients in the offshore energy, dry and liquid bulks sectors. Oran Robson, finance director at Port of Blyth, said: “The potential at the port across numerous sectors is huge, but to make the most of those opportunities and to ensure we continue to diversify our offering to protect the business’s long-term security, it’s crucial we invest now. “This series of developments will facilitate a large number of new jobs on Port land as we aim to double the number of those employed on site from 500 to over 1,000 in five to ten years. These ventures will also act as a catalyst for growth in the local economy and will no doubt stimulate inward investment into the town. Progress at the port in recent years has seen the arrival of major clients including Royal IHC, Global Marine Group and DeepOcean, with a powerful cluster of offshore energy companies and a well-developed supply chain making the port an increasing attractive proposition. The port’s on-going development in partnership with Arch of Energy Central, one of the UK’s largest quayside offshore energy development sites, alongside major projects such as EDF’s demonstrator wind farm and the North Sea Link interconnector with Norway have continued to highlight the port’s progress. Michael Hindhaugh, relationship director, Lloyds Bank Commercial Banking, said: “This investment represents a great step forward for the Port of Blyth. “The new facilities will create jobs and investment straight away, and it will help to future-proof the port, making it a driver of prosperity for many more years to come. Port of Blyth is the port operating division of Blyth Harbour Commission, an independent statutory trust established in 1882 and is one of the largest Trust Port’s in the UK handling up to two million tonnes of cargo per annum across five terminals based around the River Blyth. 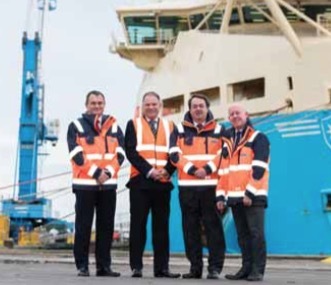 Together with major logistics and training divisions, the port group has a turnover of over £23 million and has again announced record turnover and profitability for 2016 despite challenging global trading conditions.